Where Are All of the Casino Table Games Going? There's been something really big happening over the past several years when it comes to how the games in online casinos compared to what they used to be. Games like online craps and online Baccarat get a fraction of the attention that they used to, and online slots are to blame. While this is great for online casino sites that want to get players into games with a faster play rate and a higher house advantage, there are still opportunities for players to get in on the action with classic table games like Red Dog. We want to take a look at this game for the sake of bringing it back from the dead, and I also want to look at how deposit bonuses work out on table games compared to slots to give players more options for getting value. You place a bet, and a dealer deals out two cards face-up. If the cards are the same, then a third card is dealt, and if that matches up with the first two, then you get a special 11:1 bonus payout. If it doesn't, then the hand is a tie and you start over. Also, if the two cards are one rank apart (like ten and jack), then the hand is also a tie. If the cards are more than one rank apart, then a number called the spread is established. The spread is the number of ranks between the first two cards. For example, if you're dealt a five and an eight, then the spread is two since there are two ranks between those cards (six and seven). After the first two cards are dealt, you have the option to double your wager if you'd like. If you take the option or not, a third card is dealt, and you win if the third card falls between the first two. The payout is 5:1 on a one-card spread, 4:1 on a two-card spread, 2:1 on a three-card spread and 1:1 when the spread is four or higher. Along the lines of online Baccarat, you only have one strategic decision in this game, and there isn't much to it if you want to play perfectly every single time. All you have to do is double your bet when the spread is seven or higher, but you need to keep it the same if the spread is six or lower. Play according to this strategy, and it'll be just like online slots or online craps in the sense that you won't have that much to think about except your pre-set betting system. One of the main ways that online casinos compare is in the bonuses they have available. This mostly comes down to a comparison between the house advantage of the games you're allowed to play, the wagering requirements and the percentage bonus that you're getting. 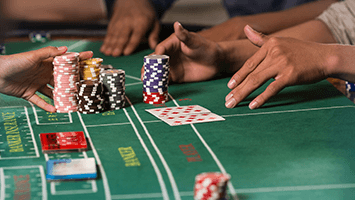 Since fewer players enjoy table games compared to online slots these days, it's critical that you seek out the best options to get good values if you do prefer table games like blackjack, craps, Baccarat or even Red Dog. Note that video poker is largely in the same boat. As wagering requirements increase, the house advantage increases or the bonus percentage decreases, the total value of your bonus comes down. Compared to slots bonuses, table games deals tend to have higher wagering requirements and a lower bonus percentage to compensate for a lower house advantage than slots. This can balance out and be fair if you pay attention to the exact terms and conditions and only play with cashable bonus offers.